Maintaining thyroid health is essential, as the thyroid is responsible for balancing and regulating hormone production throughout the body. Without proper functionality, widespread issues could be felt, including mood swings, decreased metabolism, and lack of energy, focus and clarity. Our Thyroid Support Complex with Iodine by Vital Vitamins helps provide essential vitamins and minerals to aid the thyroid in balancing and regulating hormones and improving overall thyroid health. Each capsule contains highly effective, natural ingredients that may improve hypo- and hyperthyroidism, while also aiding detoxification. Why Try Our Thyroid Support Complex w/Iodine? Our Company Vital Vitamins is committed to helping improve and enhance the lives of our customers through proper dietary supplementation that enhances health and wellness. Our products are manufactured with high-quality ingredients that help provide necessary nutrients for maintaining a healthy lifestyle. We stand behind our products and offer exceptional customer services, which is why our products are backed by a 60-day, 100% money-back guarantee! 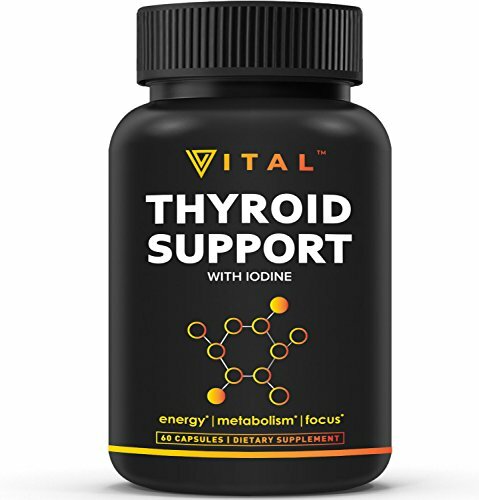 Order Your Thyroid Support Complex w/Iodine by Vital Vitamins Today! NATURAL THYROID SUPPORT DIETARY SUPPLEMENT - Our Thyroid Support Complex with Iodine by Vital Vitamins contains natural ingredients that help boost metabolism, energy, and focus. Each capsule contains ingredients such as: Vitamin B-12, Magnesium, Zinc, Selenium, Copper, Manganese, L-Tyrosine and more! SUPPORTS HEALTHY METABOLISM & DETOXIFICATION - Our natural thyroid supplement provides essential vitamins and nutrients to enhance thyroid functionality and health. Healthy thyroid function is essential to regulating hormone production throughout the body and helps control metabolism, digestion, reproduction and detoxification. AIDS HYPOTHYROIDISM & HYPERTHYROIDISM - The effects of both hypothyroidism and hyperthyroidism - the under- or overproduction of the thyroid hormone - can lead to serious health issues. Each Thyroid Support Complex with Iodine iodine supplement contains ingredients that may help regulate and balance thyroid hormones and alleviate symptoms throughout the body. ENHANCE ENERGY, METABOLISM & FOCUS - Thyroid glands help control hormones throughout the body and are responsible for regulating energy, metabolism, focus, mood and more. That's why our Thyroid vitamins provide the necessary supplementation to aid and support the balanced production of thyroid hormones. If you have any questions about this product by Vital Vitamins, contact us by completing and submitting the form below. If you are looking for a specif part number, please include it with your message.